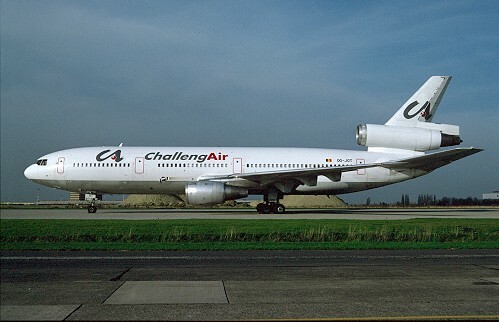 History: ChallengAir was formed on April 12 1994 by Luc Mellaerts and Pierre Jottrand to operate world-wide pax & cargo charters from its Brussels base. Besides two pax DC10, there was an attempt to operate a freighter DC10. Although a Belgian registration OO-HVA was written on this airframe, it was refused by the Belgian CAA and remained stored at Amsterdam. The two pax DC10 were mainly operated for third parties including Tarom, Corsair, Air Europe, Iberia, Garuda, Caledonian Airways and Britannia Airways. On July 28 1998 the company was declared bankrupt. The activities were supposed to be continued via another project of Mellaerts "Belgian World Airlines ", but never did materialize.